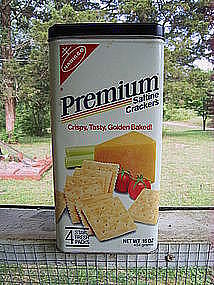 1985 Nabisco Premium Cracker Tin. Small scratches, damage to finish on the rim from removing and replacing the lid and a few tiny dings to the lid. Complete condition photos by email. I need your zip code to calculate the postage.